We live in middle-east Missouri. Our three acres have been invaded by JB's for three seasons. 2018 was the worst, seeing ready-to-harvest Peaches turn into balls of Peach and Beetle mush. Our lawn turned patchy brown and many leafy shrubs became decimated skeletons. This is no exaggeration. The revelation has been that we have worsened our own situation by trapping. On our 3 acres, we had 10 traps, set away from trees and shrubs we were naively attempting to protect. In reality, we were luring live beetles to visit, eat, breed and die happy. At the peak of the invasion, we emptied the traps twice/day. 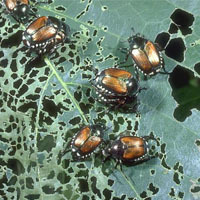 Each trap held about 10 pounds of beetles. Don't do it! We finally took down the traps and used a commercial spray toward damage control. 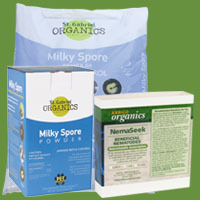 This year we will treat with Milky Spore and Nematodes. As a backup, we'll treat with a spray-on fungus as needed. No more "traps" which are in fact, mere "Beetle Brothels". Wow! 10 pounds of beetles! Thank you for the information on that, although i'm sorry you had that experience. Is the fungus Beauveria bassiana by chance?